The emergency lifting chair, new to the Irish Market. 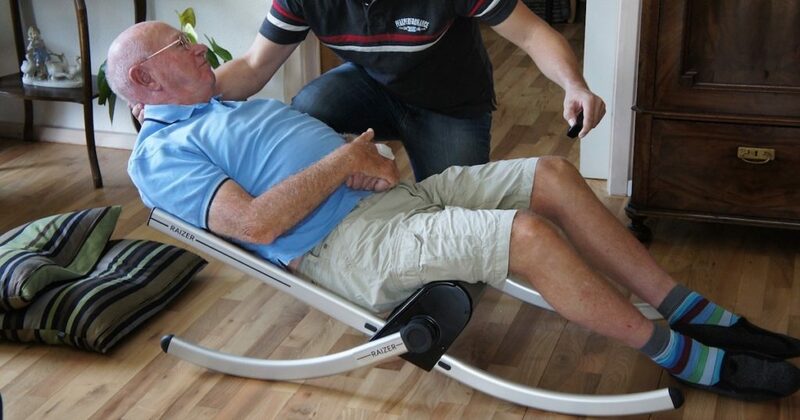 The Raizer®, a state of the art emergency lifting chair by liftup, is now available to the Irish Market. The easy-to-assemble Raizer® can be used by healthcare personnel in hospitals, in nursing homes, in home care and by those in ambulance services. Thousands of physically challenged people fall every day in Ireland and need assistance to get back up. Whether the fallen person requires to be transferred to a sitting or a standing position the new Raizer® can lift the fallen person safely and effortlessly within 20-30 seconds. Feeling safe and secure is of utmost importance to any person in need of help. By enabling the healthcare professional to keep both physical and eye contact with the person they are attending to, the liftup Raizer® facilitates this. Additionally the fallen individual has contact with the floor at all times adding to their sense of security. The mobile lifting chair is fitted with a seat belt and has a smooth transfer movement. The Raizer® can transfer individuals weighing up to 150kg, and operating the emergency lifting chair causes no strain on the assistants back. This means minimal physical effort for the healthcare professional, while still providing maximum comfort for the fallen individual. Weighing a total of just 13kg (seat 9kg; legs and backrest 4kg), the liftup Raizer® is light and easy to transport. Within 3 minutes the emergency lifting chair can be assembled and only one assistant is required to operate the Raizer, either manually or by remote control (supplied as supplementary equipment). The Raizer® is also easy to clean, disassemble and stow away in two lightweight bags. When fully charged Raizer can provide for 40 lifts at maximum load and up to 100 lifts at an average load. The charging time for the battery is at most six hours to fully recharge, however it only requires 10-15 minutes to charge an empty battery for one transfer when needed. For convenience and mobility the battery charger comes with a 12V car adapter. The Raizer® is liftup’s is certified with CE marking, conforming with all health, safety, and environmental protection standards for products sold within the European Economic Area (EEA). The liftup Raizer® is the fast and safe solution when a fallen person is in need of help. Please advise on Price and availability of the Raizer lift up chair. I am an English Nurse working in Spain.